40 posts categorized "Safe Routes to School"
ABOVE: From a previous post on SPRAWLED OUT: An example of a trail that is certainly "recreational," but A) does not connect any destinations (it merely loops through a park), and B) empties into a blind curve on a suburban speedway, further shielded by trees and shrubs (indicated with green boxes). The City of Franklin has been working for some time on a new Comprehensive Outdoor Recreation Plan, and is now inviting public input. I encourage people to come to the open house and make their concerns about CONNECTIVITY in the city of Franklin heard. As a member of the city's Trails Committee, I am sorry to report that there is precious little interaction between us and the city's Parks Commission. In fact, there has been considerable tension in Trails Committee meetings when I or any other member made requests for information on the ongoing Recreation plan. A member or the Parks Commission who also sits on the Trails Committee has made it clear that he considers the trails proposed by the Parks Commission as completely separate and unrelated to the sidewalk and trail network we on the Trails Committee are trying to create. He has repeatedly spoken in "us vs. you" terms when the subject of funding comes up. The problem is this: Trails are, indeed, recreational. However, it's time to look at trails as part of the city's overall connectivity plan. Trails (and sidewalks) are infrastructure, and it's important that we provide a way to get from place to place in Franklin without a car. This will not be my last post on the subject (nor is it the first), but please mark your calendar for January 24th, 6-8pm, and plan to attend the open house so you can voice your concerns regarding making Franklin travel-friendly for children, the elderly, and differently abled persons. This update is set forth in a draft document entitled Comprehensive Outdoor Recreation Plan: 2025 for the City of Franklin, Milwaukee County, Wisconsin. This Plan is being prepared to maintain the City’s eligibility to participate in many cost-sharing programs for the acquisition and development of its park, open space, and outdoor recreation system. When completed, the updated Comprehensive Outdoor Recreation Plan will look 15 years into the future at the City’s anticipated park, open space, and outdoor recreation needs. Before the draft is completed, the Planning Department staff of the City of Franklin would like to provide an opportunity for the public to ask questions and to provide additional comments about this draft Plan. Therefore, an Open House has been scheduled for January 24, 2011, from 6:00 to 8:00 pm in the Community Room at the City of Franklin City Hall, 9229 W. Loomis Road. Copies of maps and other select information from the draft Plan will be on display at the Open House. The entire draft Plan will be available for viewing on the City website and at the offices of the Planning Department approximately one week before the Open House. It is envisioned that the public comments provided at the Open House will be summarized and provided to the City of Franklin Parks Commission for their review and consideration immediately after the Open House or as soon thereafter as the Parks Commission may determine. If you have any questions, or need additional information, please feel free to contact the Planning Department at 414-425-4024, or visit the City of Franklin website at www.franklinwi.gov. Elections this coming April in Franklin will put on the ballot aldermen from districts 3, 4, and 6 as well as office of the mayor. My district's alderman, Kristen Wilhelm, has decided to run again for the seat. This is good news: As a resident of the 3rd District -- as well as a volunteer on various city committees and commissions -- I can say without hesitation that her energy and efforts have resulted in positive change for Franklin. And, as an attendee at various common council meetings, I can also say that she has changed for the better the character of what was once an insular "old boys club." Perhaps the best endorsement for Ms. Wilhelm is the fact that, at the beginning of her term, a few of the "old guard" aldermen had been observed expressing frustration that she'd "slowed" certain meetings by asking questions and seeking clear explanations. You only have to see that once to realize that her presence has required complacent members to step up their game -- AND made them put away the rubber stamp. On a personal note, Alderman Wilhelm worked with me to write a successful Safe Routes to School grant for the city, was instrumental in getting the grant that made the sidewalk on 51st Street possible, and helped make our Walking Workshop a huge success. She makes sure the residents of the 3rd District are the most well-informed in the city via regular email updates and notices. Let me put this in bold, because I mean this emphatically: Kristen Wilhelm's hard work, creativity, attention to detail, preparation and accessibility has, without a doubt, raised the bar for the entire common council. We are lucky to have her working on behalf of the city, and fortunate that she is a glutton for punishment and has decided to continue. So, yes, this is an endorsement. I've pasted below her candidacy announcement. I am officially announcing my candidacy for 3rd District Alderman this spring. It has been a privilege to represent you and serve the city of Franklin. Since 2008, I have worked hard to represent you and be responsive to your needs in a timely manner. By informing and connecting people to city government, a stronger voice on city decisions has been achieved and this has strengthened our sense of community. On that topic, I’ve endeavored to support local businesses and make you aware of issues and events as often as possible. It is not easy making progress given the pace of government. There is more to accomplish, including finishing several tasks requested by constituents that are in process. I fully intend to continue my tenacity to bring the results you expect and that best serve our city. Looking to the future, I’ll continue to provide Real Representation, maintain Effective Communication, create more Process Transparency, and remain Accountable to you! • Continuing to engage in meaningful dialogue. • Being available to hear your concerns. • Following through on issues that matter to you. • Getting the word out to as many of you as possible in these busy and trying times. I ask for your support so that I may continue representing you as your Alderman in this great community! Please add wilhelm4district3@gmail.com to your address book to be sure future emails are recognized by your email allowed list. I am required to separate campaign items from city business. This gmail address is to be used for all campaign related business. The graph above shows the most recent USDOT vehicle-travel data covering the last 25 years. Although vehicle-miles of travel (VMT) grew steadily during most of the twentieth century, in recent years the growth rate stopped and even declined a little. It is now about 10% below where it would have been had past trends continued. The Twentieth Century was the period of automobile ascendency, during which personal motor vehicles grew from virtually nothing to becoming the dominant travel mode in most developed countries. During this period it made sense to invest in automobile-oriented infrastructure: paved roads, highways and parking facilities. However, demographic and economic trends are changing travel demands. Aging population, rising fuel prices, increasing urbanization, increasing traffic congestion, improvements in alternative modes, changing consumer preferences, and increased health and environmental concerns are all reducing demand for automobile travel and increasing demands for travel by other modes. Although automobile travel will not disappear, it will not grow as it did in the past, and in many developed countries motor vehicle travel will be flat or negative in the future. More bike riders create "safety in numbers"
As ridership goes up, crash rates stay flat. It's happening in Portland (see page 11 of this report[PDF]). It's happening in New York City. I just found out today that a grant I wrote with my alderman, Kristen Wilhelm, resulted in Franklin being selected as one of 34 Wisconsin communities receiving Safe Routes to School funds! P1090471, originally uploaded by John Michlig. 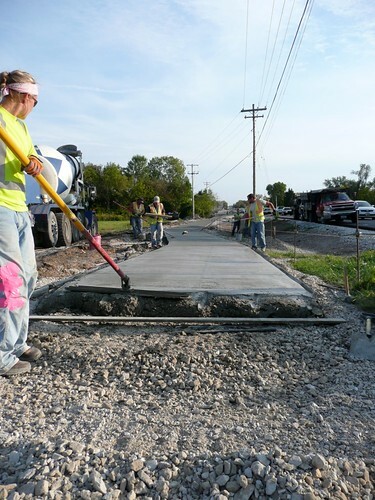 Cement was poured and smoothed today to complete the portion of the 51st Street sidewalk located in front of the high school. Click on the photo to see a set of shots on Flickr.